ConnectCode MICR E13B Font is a Magnetic Ink Character Recognition font based on the E13B industry standard. This is a widely accepted standard in the US, Canada, Australia and many other countries. This character set comprises of ten numbers (0..9) and four special symbols(Amount, Domestic, BSB and Dash). TrueType fonts - For use in Microsoft Windows environment. Calibration fonts - For overcoming printer misalignment or toner problems. These fonts can be found in the CalibrationFonts subdirectory. PostScript fonts - For supporting high-end image setters. These fonts can be found in the PostScript subdirectory. OpenType fonts - For universal support across different machines, platforms and locales. These fonts can be found in the OpenType subdirectory. ConnectCode MICR E13B Font is extremely easy to use despite being a package that provides one of the most comprehensive numbers of fonts. In most cases, users will only need to use the default MICR E13B font provided in the package. This is the font that we have tuned, optimized and found to work on all widely used MICR hardware. 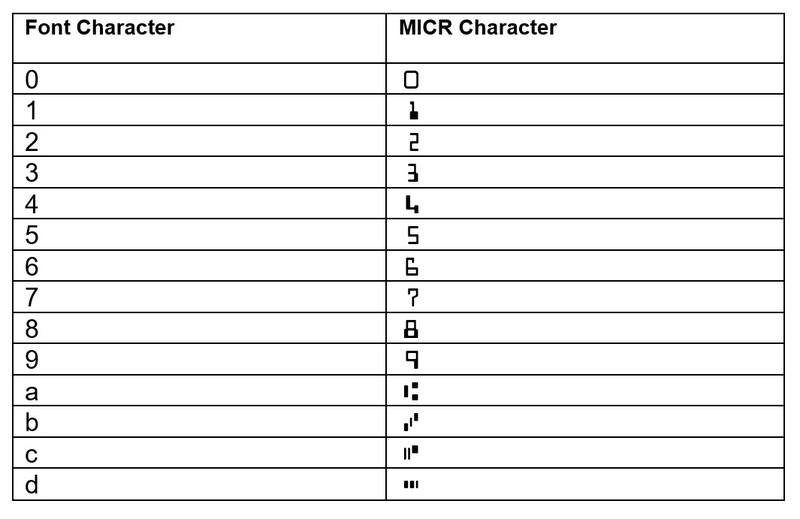 We have distributed MICR fonts for many years and this is the font that has helped users simplify the deployment of their MICR solution significantly. This is also the font we recommend for users without prior MICR experience or the font to get started with when using our package. When using the MICR E13B Font, simply set the font name to CCodeMICR (or CCodeMICRT for the Trial) and choose 12 points for the font size. Enter 0 to 9 for the numeric digits and lowercase a,b,c,d for the special symbols - Amount, Domestic, BSB and Dash. 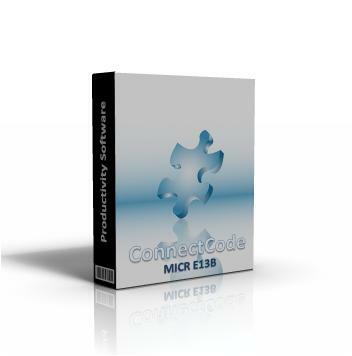 ConnectCode MICR E13B Font has been designed and developed according to the industry specification ISO 1004:1995. The fonts have been tested vigorously on many different types of MICR hardware internally and also by many different organizations externally. However depending on the users' printer, paper or toner used, slight misalignment in the characters may still occur. Some printers can also be prone to alignment inaccuracies. Calibration can be performed to improve misalignment (if any) and ensure optimal scanning of the characters. All the MICR E13B fonts can be embedded into a PDF (Portable Document Format) file without any limitations or restrictions. All the MICR E13B fonts adhere strictly to the ISO1004:1995 specifications. ConnectCode MICR E13B Font provides additional value by including 4 professional security fonts (in the SecurityFonts subdirectory) to print payee names and check amounts securely. Users can choose from the standard form or a form with text printed below each character. The Security Fonts help prevent alteration and forgery. The MICR fonts package comes with a 1-year maintenance upgrades and priority support.